You are here: Home / Mergers & Acquisitions / Franklin Press Inc.
As Continental Graphics Holdings was focusing on its core competencies of specialized technical information to the aviation industry and film services to the entertainment industry, it decided to consider a divestiture of Franklin Press. 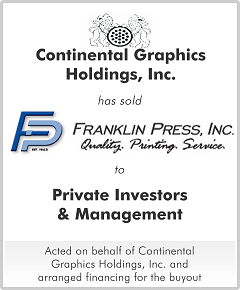 During the sale process, it was determined that a private investor that included management in the ongoing equity interest, offered a transaction at the highest value to Continental Graphics. The financing consisted of a revolving credit facility and term loan secured by the working capital assets and machinery and equipment, respectively. A separate real estate term loan was raised using Franklin’s property as security. The equity investment and financing was sufficient to provide ample availability under Franklin Press' revolver to pursue growth opportunities post closing.